Anyone who has experienced the truly unbounded nature of self will have recognized that there is no self in the way that we have been trained to believe. There is no individual ‘me’ that exists separate from the rest of reality. When we think of shifting into a new sense of self we can’t help but think in terms of us shifting, but that is not the way this shift happens. You don’t let go of one sense of self and pick up another. The sense of self is not something that you have. It is not something that you let go of and replace. You are not a thing that has a sense of self to let go of. You are not a thing. You do not exist as a separate entity that thinks and chooses. There is no separate object that is a being called Jeff. The reason that we have to go this far is so that we can completely unhinge ourselves from our current conception of reality. The phrase “You can’t get there from here.” is apropos. You are currently thinking from inside of a thinking-thing assumption of self. You have no choice about it. You experience yourself as a thing that thinks and that experience limits how and what you can think. Earlier, we defined the self as a platform of perception. It is something you stand on and perceive from like an observation deck. If you are standing on an observation deck you can only see the view from that platform of perception. If you live inside of a thinking-thing belief system you can only perceive the reality that a thinking-thing perceives. The next sense of self will not emerge out of our current world because sense of self and the world it emerges out of cannot be separated. They represent a necessary unity. They mutual define each other. You can’t have an inside without an outside. You can’t have an above without a below. And you can’t have a self without a world, or a world without a self. The world we know is the world of the thinking-thing self. The new self will arise within a new world. Everything has to change at once. A completely new experience of reality will be born and we – in the form of the thinking-thing self that we have known ourselves to be – will not be there to witness it. We are like a ball of yarn that thinks it will be there after the unraveling. We will not be there after the unraveling of the self. We are the self that will be unraveled. We are the dream of separation that the new self will wake up from. We are not the dreamer. We are the dream. This does not mean that there is no continuity between the current experience of reality and the next. Reality is subjective. It is experienced. There is a universal subjectivity that gives this universe life. That universal subjectivity is currently caught in a dream of separation. We are that dream. The true source of awareness that is absolute subjectivity will wake up from the dream. When it does, our current identity will not be there to witness it. A new self is not going to awaken in us, in this world. A new world containing a new self will appear simultaneously as one. We will be that, but we won’t recognize ourselves. The absolute subjectivity that is the source of life in this reality will be the source of life in the next as well. We are that. The challenge we face now is to get a glimpse of a self that is not limited to an individual, while at the very same time being an individual who is contemplating a new self. The fundamental obstacle to the realization of a New Self is our relationship to our experience. The belief that we are having an experience of reality is the root cause of our sense of separation from reality. We have been deeply indoctrinated into a belief that we are in contact with the world through our senses, taking in information that is turned into a picture of the world that we experience. We imagine that a memory of the past is like a movie that was stored in our mind to be viewed later. We imagine that when we envision the future we are generating images of possibilities that we can strive toward. And we look out at the scene in front of us having been taught that what we are seeing is a picture of reality constructed by our minds. So at times when we discover that things were not the way they appeared to be, we don’t assume that reality changed; we assume that we had previously misconstrued reality. We have been trained to believe that reality exists separate from us and that we hold a potentially flawed picture of it in our minds. Before anything happens we unconsciously assume that we are a thing that moves through time gathering information about each passing moment, storing that information as memory, imagining and living into different possible futures. We are a thinking-thing that experiences a reality that we are living inside of, but separate from. This entire construct has to go if we are to experience a radically different possibility. To see through such a profoundly conditioned relationship to life takes tremendous concentrated attention and a huge heart. In my life the practice of meditation has been a vehicle for explosive journeys beyond the assumption of separation. In deep meditation I can let it all go, everything. I can allow my sense of being separate to dissolve and disappear. Reality returns to what it truly is – an ongoing cascade of continuous experience without gaps, breaks or separation. In deep meditation there is no me experiencing reality. There is just a flow of experience that includes periodic experiences of feeling like a thing that experiences reality. Reality is a dazzling fluctuation of perception. Everything, everything, everything is another experience. There is no ‘me’ experiencing reality, and there is no reality being experienced. There is just experience. My sense of self is not a self, it is an experience of being a self. The contemplation that we are engaged in right now is not ‘a’ contemplation. It is not an activity that I am engaged in. It is an experience of being someone who is engaged in the activity of contemplating. If we, in our thinking-thing delusion try to imagine a New Self we find it impossible. Our current sense of self cannot imagine its successor. Luckily it doesn’t have to. The thinking-thing doesn’t need to imagine its successor. 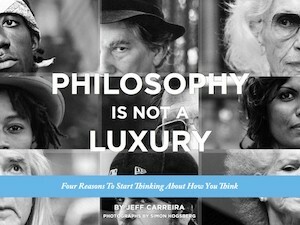 The thinking-thing is not on a journey into its next incarnation. The thinking-thing simply needs to step aside and allow reality to reconfigure a new world around a new conception of self. The next self-sense is not going to be constructed by thinking-things, it is going to grow out of the ground of reality the way a tree grows out of the ground of the Earth.